This is a red letter day to be a geek, guys! First, check out the first sneak peek of Martin Freeman as Bilbo from The Hobbit, just released by Peter Jackson through Entertainment Weekly! Hit the link for a few more pics, or pick up this week's copy (on stands tomorrow) for the whole story. 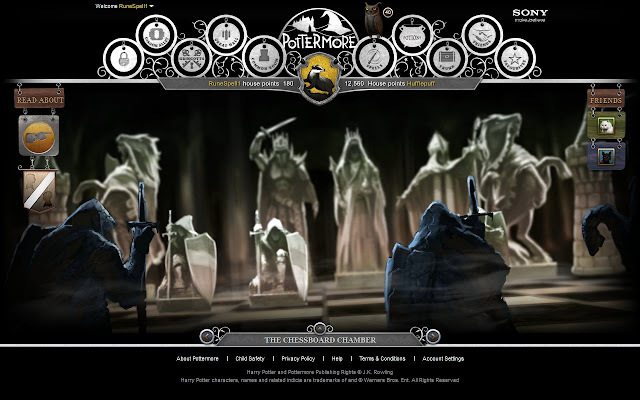 - Pottermore is an interactive new Web site and reading experience with more than 18,000 new words from J.K. Rowling. - One million fans will get access to a beta on July 31, Harry's birthday. It will be open for all in October 2011. - You will follow the story, get sorted into a house and get a wand (one of 33,000 possible combinations) - all crafted by JKR. For this groundbreaking collaborative project, J.K. Rowling has written extensive new material about the characters, places and objects in the much-loved stories, which will inform, inspire and entertain readers as they journey through the storylines of the books. More screen shots here, and lots more information here. I've never been much of on online gamer, but darned if THIS wouldn't get me hooked. Granted, this will probably be more like an interactive story book than an actual game, but allow me a moment to imagine WoW-esque gaming in the Harry Potter world, won't you? [imagining] Mmmm. Yeah. That's the stuff. So, anyone else excited by today's news? I am wonderfully excited about the Hobbit. I have never been a huge LoTR fan, but my dad gave me a copy of "the Hobbit" which was a book that he read as a kid on the train to Chicago for work one summer. I held on to that book for 4 years reading the first chapter like 10 times before I could concentrate enough to finish it. I LOVED IT!!! Once I really got into it, I couldn't put it down. And it was something I was able to really share with my father. I'm soooo excited to see it on the big screen. I think I'll read the book again before it comes out though! I am! I wonder how you get picked for the beta? O.M.G. I just got tingles! Horray for Pottermore! Part of me wants to tell everyone about it, and another part wants to keep it to myself, (to keep the numbers down), so that I can have a better chance of being in the 1 million Beta users!!! Finally! Something reasonalbe to look forward to. Pottermore rocks my face off. My jaw has completely dropped almost to the ground with Pottemore! That looks too cool. I can't wait to see the Hobbit. Hey Jen, I sent you that Epbot tote bag that I painted a few months ago. (It has the robot on one side, and a Steampunk version of the Epbot logo on the other side.) I was wondering if you got it? ZOMG! Today is a definitely a great day to be a geek!! SQUEEEEEEEEE! I'm so freakin excited for both Pottermore AND The Hobbit!! Martin Freeman makes a great Bilbo :-D I'm totally buying EW tomorrow! Surpringly; I was less than thrilled about JK's description of the website. Now that I see some screenshots - Thanks Jen! I'm a little more enthused. It looks like she's creating something like Facebook for Muggles. Should be interesting! Uhhhhhh...who was up at 5:55am to hear the announcement first thing? This girl was!!! I sooooo hope I can weasel my way into the beta version! And I can't wait to finally see The Hobbit!! So exciting! I can't wait for The Hobbit to come out. I'm a Tolkien geek. I'm re-reading it by reading it to my 4 year old every night. She seems pretty interested in it. Plus she usually falls asleep after about five pages. A win-win in my opinion. I'm a little disappointed that PotterMore wasn't an MMO similar in awesomeness to WoW. But this sounds pretty cool too. It'll be really interesting to try it out when it's released. @ Rachel S. - Oh, my goodness, yes! Did I not tell you? Ack! I'm such a jerk! Yes, I got it, and yes, I love it. It's on the shelf right next to me, here in the office! If you can send me your mailing address, I have a (very belated) card to send you! Squee! To The Hobbit! I've always felt like I was just an overgrown, non-hairy hobbit, so the chance to see Bag End again makes me so happy! Okay, and as one obsessed with pretty shiny things, I cannot wait to see Thranduil. First thing I did when I turned my computer on this morning was immediately check the JKRowlingAnnounces youtube page. And then I made a sound of glee whilst smiling widely. And then I tried 7 billionty times to register for Pottermore, to no avail. But in case it was not clear, OMG YAY CAN'T WAIT! 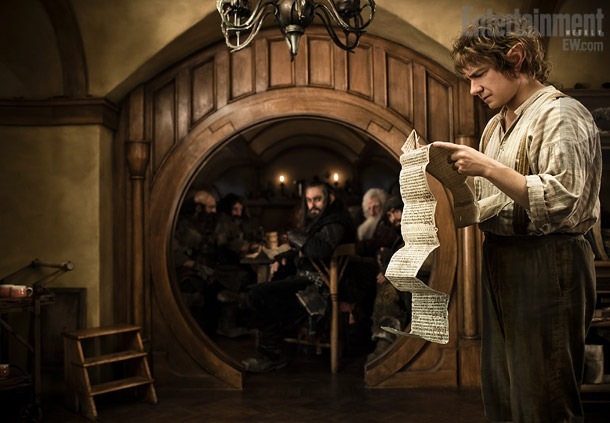 Is that Khal Drogo from Game Of Thrones lurking at the back of the picture of Martin Freeman/The Hobbit? Thank you so much for posting about this! I had no idea this was going to happen! I am enjoying passing on my husband's and my love of all things Potter to our children and this will be another way to enjoy the books all over again, since we already have the books on tape (I know, right?) CD and in movie form). I suppose I would be excited about Pottermore if it didn't sound so bland. I was pretty excited for the announcement, only to find that the announcement is that in 1-4 months the website will exist. Uh, yippee? Not to mention I'm still not really sure what it is. All websites and reports are saying it's "an experience" okay, well what does that mean? And the screenshots look kind of cool, but as far as I can tell, it's basically gonna be a site where JKR will post background info that wasn't in the books. The sorting into houses and wands thing might be interesting, but when the first couple of movies came out, the HP Warner Brothers site did that, not to mention all the other similar fan-made ones that exist. I'll admit that having JKR take part in that set up is kind of neat, but that whole process isn't enough to make the website worth looking forward to. What else does Pottermore actually do? Oh yeah, you can buy and read the books. Because no one's ever done that before. The only thing that I can see that lends itself to more than a couple of visits to the site is the mix potions/help win house cup thing. Which is nice and all, but how long does that go on? And how long will that actually be fun to do? I don't know. I feel like a wet blanket here, but I just don't see how the announcement was worth all the attention and excitement. "Hey guys, in 4 months you'll be able to see a website. It involves Harry Potter"
..and the world goes mad. Almost squealed out loud at work when I saw the Hobbit picture!! So, so very excited. @ Anony - nah, I totally get your point! Like I said in the post, my dream would be to see an interactive, immersive gaming environment - but, like you, I suspect it won't be. But we can hope, right? And the good news is we know there's plenty of money behind the franchise to do it right - really, there are no limits to what they *could* do. I love it! And the timing for Pottermore couldn't be better, with the films coming to a close. Something to look forward to! OMG!!!!! Jen you made my day with the Potermore annoucement! I already went to the site and left my email address! This is why I love Epbot, you share the greatest stuff! I was up at 4am this morning when the Pottermore announcement was made (I wasn't up for it, I'm just an insomniac). The promo images look awesome, but like so many other people, I'm a little disappointed about the lack of explanation. Nevertheless, I will be trying my damnedest to be among the first one million who get to beta test it. I'm looking forward to getting additional background info on some of my favorite characters! Potter yay, Hobbit not yay. I'm still pissed with how they handled the last two LOTR movies. Especially the last one. They're just going to **** the Hobbit up too. Peter Jackson claims to be a FAN of the books?!?! Faramir takes Frodo into custody?! No he didn't! Did you thoroughly miss the symbolism when you supposedly read the book? DID YOU EVEN REALIZE YOU COMPLETELY SKIPPED THE VERY IMPORTANT SCOURGE OF THE SHIRE?!? YOU POSER! I have to stop...I'm getting all riled up like it's 2003! Sorry to rant, it's a touchy subject. The link won't let my put in my email. Starting to hyperventilate. Kids are scared. So how are they planning on making money with Pottermore? I don't see the e-copies of the books making it worth their while (cause they could have done without the website anyway). And maybe I'm a cynic, but I don't see them making such a big deal about it without expecting to turn a profit. So what are we expected to buy? I'm excited but just wait until I tell my boys! OOOhhhh the excitement!!!! We just finished Lego Harry Potter too. The timing couldn't be better!!!! I liked knowing how their lives turned out. So, I have decided that you and I are friends. We must be. We geek out over so many of the same things. who cares that you are in Florida and me in Utah and have never met. We are Pals. I am thinking (hoping) that Pottermore will offer the chance to read my books for the 15th time with footnotes and deeper information. where it goes from there is bonus for me. and Hobbit... where to even begin. there is a LOTR geek that has been laying dormant for a few years just simmering, waiting to get out. Squee! I Love sharing your pages with friends. I didn't hear about Pottermore! 8D That looks really cool. EXTREMELY excited by Pottermore. Possibly even GLEEFUL. Since you asked for other exciting things: This made me think of you. Star Wars! Comics! Ghostbusters! Disney! And so much more (geeky)stuff, all of it so pretty. Jen, please sit down and prepare to squeal. If you do come visit, please let me know. . .
OMG that picture is SO cool.